Exchange Bank of Missouri is so excited to offer School Pride Cards. You love your schools, and we do too! 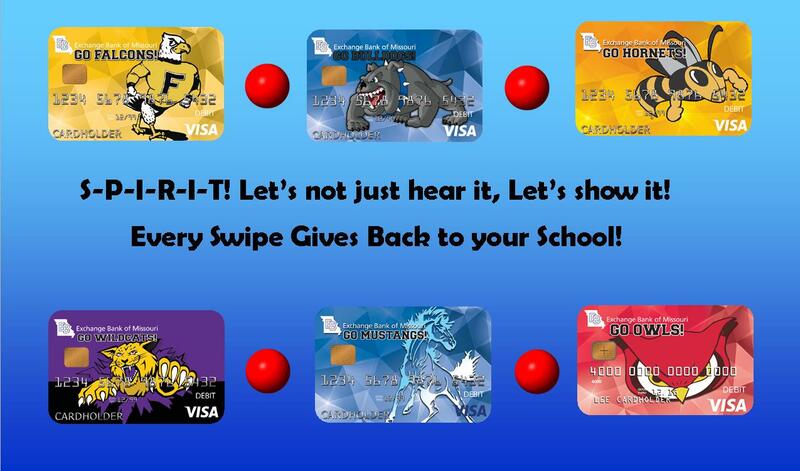 For every purchase made on your card, the bank will give so many cents back to the school that corresponds with the mascot on your card! Come into your local branch and find out how to get yours! For a limited time, every swipe on our Fayette Falcon’s Card will go back to the Fayette High School Band to help fund their invitational trip to Washington D.C.! Fayette Falcons, New Franklin Bulldogs, St. Peter’s Mustangs, Slater Wildcats, Marshall Owls, and Fulton Hornets.